Are you looking for the perfect location to celebrate your anniversary or an ideal destination for Mozambique honeymoons? Well, your search stops here. We are Mozambique’s top tour operator with the best rates and service for all holiday packages in Mozambique. Our team of knowledgeable advisers is always ready to help you pick the best package for your holiday requirements. Escape the crowds in Zanzibar and Mauritius with a holiday in the beautiful Quirimbas Islands. The most remote and exclusive of Mozambique’s glorious holiday islands, this spectacular holiday destination features striking island resorts, beach lodges and hotels that offer luxury and comfort that are second to none. Enjoy the best of Quirimbas holiday accommodation at Ibo Island Lodge, where you can experience culture and the slow-paced tempo of island living. You can spend your holiday doing as little or as much as you like on Vamizi Private Island, enjoying the many exhilarating activities available on and around the island. You can also own your own piece of paradise by booking Anantara Medjumbe exclusively for sole use. The Quirimbas are renowned for their pristine coral reefs and rich marine life, offering some phenomenal opportunities for diving and snorkelling in its warm, crystal clear waters. Book one of our resort and hotel package deals to this idyllic place and enjoy total escapism in one of the most magnificent places on earth. With plenty to offer the discerning tourist, Ibo Island Lodge has designed a uniquely wonderful way to explore this breathtaking string of islands – the Mobile Island Dhow Hopping Safari! Take advantage of our packages that include this exciting adventure expedition to experience this region in all its glory. As the top performing operator in Mozambique, we offer affordable rates on Quirimba holiday accommodation packages. We have been in the business of selling holiday packages for over 20 years and know Mozambique quite extensively. We are more than happy to tell you all you need to know about the Quirimbas Archipelago – Ibo, Quilalea, Vamizi and Medjumbe. Let us arrange a special package deal that will incorporate a unique itinerary that allows you to get the best out of your vacation in Mozambique. Our team of friendly consultants, who have been to the destinations we sell, are more than happy to assist you with planning your dream holiday. You too deserve a break in a tropical paradise, so why not get in touch with us today to book your holiday of a lifetime? The beautiful country of Mozambique, on the east coast of Africa, is one of the most amazing tropical destinations you will ever visit. Not only does it offer excellent holiday package rates and a choice of special deals for everyone, but so too does Mozambique offer diverse holiday destinations. Find a genuine tropical paradise with a choice of beach resorts, island villas, wildlife safaris and city hotel destinations. At Mozambique Travel we offer Mozambique holiday packages that are ideal for families, honeymoon couples, and business retreats. We guarantee the best rates and packages and you can book online. Beach Lodges or Island Villas? Mozambique occupies a prime location with an endless white shoreline bordering the warm and wonderful Indian Ocean – it is no wonder that Mozambique holiday packages can be found to suit all budgets and requirements! There are few places that provide you with such an exotic break from the rigours of everyday life. Mozambique holidays can take many forms and at Mozambique Travel, we bring them to you. Your special package may include a visit to one of the many stunning Mozambique beach lodges or a stay in the capital, Maputo. Here you can enjoy the lively bars, wonderful restaurants and quaint shops from your luxury hotel. With special package deals, you can perhaps enjoy both. Some of Mozambique’s best accommodation comes in the form of its exclusive private and truly elegant island destinations reached by private charter or boat and offering something totally extraordinary and off the beaten track, so to speak.As one of Africa’s top tour operators, Mozambique Travel has access to the very best villas, lodges and beach resorts in Mozambique, both on the islands and on the mainland. We can find you the perfect package deal, from wilderness safaris to island retreats and we also offer combo specials -tailor make your ideal holiday and make Mozambique your destination of choice. See it to believe it –we offer a range of combinations for honeymoon couples, families and business delegates alike. We know what everyone likes – good service, modern facilities and fantastic surroundings! From Maputo, set off on day trips to Kruger National Park in South Africa or Inhaca Island in the bay. Read more about Maputo here. Mozambique is a diving and snorkelling paradise and land of best beaches in Africa. Fishermen will want to hook game fish while families will want to take ocean safaris and climb the sand dunes. Divers will seek out the unique dive sites, some still unexplored and everyone wants great accommodation, fantastic food and know that they are guaranteed world class service from the smiley people of this country. Mozambique Travel offers you the best rates and package deals online. With something for everyone, Mozambique holiday packages can be arranged to encompass every aspect of the country. For a relaxing and exotic break it is strongly recommended you take a look at the amazing choice of Mozambique beach resorts, island villas, and luxury hotels. The beautiful Bazaruto Archipelago off Vilankulo and the Quirimbas Archipelago off Pemba offer genuinely exotic and exclusive holiday opportunities that cannot be matched. If you are keen to travel to a remote Quirimbas wilderness, then Medjumbe Private Island is for you – picture rustic eco chic accommodation on the beach, promising you the holiday of a lifetime. A five day package deal includes your return flights and air transfers between Pemba and the resort, all three meals, your drinks, wonderful water sports including kayaking, windsurfing, hobie cat sailing, and pedallo boats for a bit of fun! Mozambique travel packages to places like Ibo Island Lodge can be linked to the other Quirimbas Islands and exotic destinations. Mozambique Travel will assist you to also book an exclusive beach and bush experience, combining Ibo Island with a true African safari in Gorongosa National Park. Or a holiday with a difference on a yacht charter from Ibo Island into the Indian Ocean! Check out our beach-bush combos here. Combine water sports with ocean safaris, island beauty and cultural interaction – Mozambique holiday packages in the Quirimbas Archipelago to fulfil any visitor’s expectations. A honeymoon special deal at delightful Medjumbe Private Island includes a fresh fruit platter and bottle of wine in villa on arrival, a three course romantic dinner for two plus wine, a snorkelling trip for two. And the bride pays half price on accommodation! Islands in the Bazaruto Archipelago off the Mozambique coast at Vilankulo are famous for their unique Stay Pay packages – at Anantara Bazaruto Island Resort & Spa choose your accommodation and stay for five nights but only pay for four! 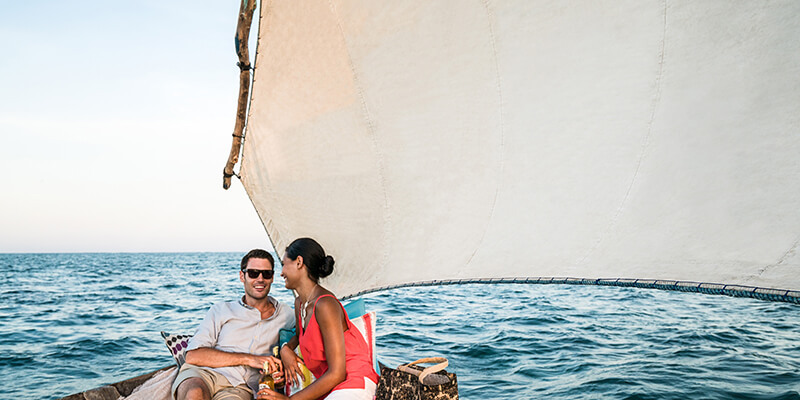 This Special Mozambique Package includes return boat charter transfers from Vilanculos to Indigo Bay, three meals daily, local drinks and select alcoholic beverages and non-motorised watersport activities. A family holiday package to Mozambique will include diverse activities for adults and children including snorkelling, boat cruises, fishing, scuba diving, horse riding and more. A Mozambique holiday package to Inhambane, in the south of Mozambique, may include a few nights at Barra Beach Club. You could get a special rate if you choose your seasons at the right time! Break from the rat race and find real value for money – choose stay-pay special packages during low season and you cannot lose. Mozambique Travel has a holiday package just for you! Enquire here. There are many beautiful countries in Africa that make superb choices for a holiday or vacation, but few can match the sheer beauty and wonder that is found in Mozambique. This amazing east African country boasts some of the world’s most spectacular and secluded beaches, as well as a choice of tranquil and remote islands that offer a true island paradise experience, and with holiday packages to Mozambique offering a chance to experience many facets of this glorious place – plus of course the stunning weather – now is the time to check out the astonishing choice of Mozambique accommodation and holiday deals. Holiday packages to Mozambique are a surprisingly affordable way of getting to know this friendly and welcoming place and can include a trip to the capital, Maputo, as well as a stay in one of the many fine beach resorts. Maputo hotels can be found to suit all budgets, and are essential if you are to visit the famous Elephant Park, not far from the city, where you can see these majestic animals in the wild. Mozambique holiday accommodation comes in the form of fine hotels, beach lodges, and villas, some in, particularly wonderful locations. No holiday packages to Mozambique would be complete without a stay on one of the truly stunning islands; the Bazaruto Archipelago features many superb locations and is home to some quite amazing resorts, while the beauty of the Quirimbas Archipelago cannot be beaten. Remaining unspoilt but for the luxury yet unobtrusive lodge resorts that have been built there – check our Benguerra Lodge, the first of them all on the island of the same name and a quite stunning place to stay – these tropical islands, with their soft white sand beaches lined with palms and the Indian Ocean lapping at the shore, are simply the furthest you will get from life back home. On the mainland, the very best beaches can be found on the Inhambane Coast, a stunning stretch of spectacular coastline that is well worth a visit. With charming towns and villages, Inhambane itself among them, to visit and fabulous diving and snorkeling opportunities, this is a place to come whether you want to relax on the beach or indulge in water sports activities and is a popular choice for holiday packages to Mozambique. The beautiful clear blue waters are ideal for watching the amazing marine life that inhabits these parts. The attraction of holiday packages to Mozambique lies in the sheer variety that this charming and exotic country provides to the visitor. With a choice of special travel deals involving beach resorts and other Mozambique accommodation we can help you find the best package for your holiday, and as the acknowledged experts in Mozambique travel, we have access to the best lodges, villas, and hotels on the mainland and the islands. Whether you are looking for a family holiday, a break for a couple or even that very special honeymoon in Mozambique, get in touch now and one of our expert team will help you find the right deal for you. The wonderfully diverse country of Mozambique, with its Indian Ocean coastline, wonderfully exotic islands and friendly, welcoming towns and cities, is one of the most popular holiday destinations in Africa, and the colourful town of Inhambane – capital of the province of the same name – is certainly worth a visit. A historically important town in a quite beautiful coastal location, it is home to many fine choices in Mozambique accommodation, and also close to many of the best Mozambique beach resorts on the mainland. With many fine old buildings reflecting the developing culture of East Africa, this wonderful place is a great addition to a holiday package in Mozambique. The town of Inhambane developed thanks to its strategic location, making it an ideal port for trade that was fast growing over the years, and is recognised as one of the oldest settlements in East Africa. Trade has been recorded here as long ago as the 11th century, and the town has grown in stature since then to become one of the most important in the region. However, it remains a quiet, friendly and relaxed town popular with those enjoying Mozambique beach holidays, with its intriguing colonial architecture adding a special touch to the surroundings. The Inhambane Province is highly regarded for its Mozambique beach resorts and the town is an excellent base for exploring this wonderful area. Off the coast is the magnificent Bazaruto National Park, the largest and most important marine park in Africa, while a short drive away is the village of Tofo, where you can stay in luxurious villas and dive in what is one of the most highly regarded spots in the world, famous for its whale sharks, manta rays and turtles, and known affectionately as the whale shark capital of the world. Inhambane is known in local language as the ‘Land of the Good People’, and wherever you go in this accommodating town you will find you are welcomed with open arms. As the acknowledged experts in Mozambique travel we can help you find the very best deals in accommodation and hotels in the town and province, as well as elsewhere on the Mozambique mainland plus the Bazaruto Archipelago and the Quirimba’s. Our friendly team of expert advisers have access to the finest accommodation plus the best packages, deals and specials, so get in touch with us right away and we will be more than happy to help you book a dream holiday in this quite spectacular location. Discover your slice of paradise in the uncharted waters of the Indian Ocean. In the northern region of Mozambique, off the coast of Pemba, lies a beautiful string of islands known as the Quirimbas Archipelago. Here, you will find Quilalea Island, home to the ultra-luxurious Azura at Quilalea Private Island. Deservedly awarded a Tripadvisor Certificate of Excellence, Azura Quilalea is a premier destination that effortlessly balances its breathtaking setting, chic accommodation and excellent service to provide a memorable experience for its discerning guests. Fashioned from natural coral stone and makuti thatch and adhering to eco-friendly principles of using solar power and wind generated electricity as well as using water collected through rain water harvesting and desalination, this Mozambique accommodation is a tree hugger’s ultimate resort. A look at the candid photos will attest to the splendor of Azura Quilalea, which offers 9 sea-facing villa comprising 4 Kusi Villas, 4 Kaskazi Villa and the sumptuous Villa Quilalea. In each villa has tea/coffee facilities, air conditioning, a fridge and butler service among other mod cons. Indoor and alfresco showers, private decks with day beds and sun loungers complete the picture of absolute indulgence! From the guest feedback and Trip advisor hotel reviews of Azura at Quilalea, it is clear that the level of comfort and hospitality at this island resort is out of this world. Our consultants rave about the top class service and the aura of romance exuded from every facet of this top Mozambique beach property. The staff are very attentive and on point, not to mention the food! We also like that it’s family-friendly and that kids can also enjoy snorkeling from the beach. Chloe Fox from Buckinghamshire finds the resort impossible to fault, “Our 4 nights at Azura Quilalea were amazing and the only downside to our trip was having to leave this gorgeous island. Our 2 sunset villas had a wonderful position on the beach which allowed us to walk straight into the sea. The sunset views from our villas were spectacular. The food too is exquisite and the team make this place even more special with their warm smiles and eagerness to please… I would recommend it to anyone and hope to return one day. The choice of luxury lodges and hotels in Mozambique which offer tourists amazing holiday accommodation packages is endless – mostly all inclusive of meals, drinks, some water sports, transfers to and from the destination and extra surprises! This is all part of the vacation experience when visiting such a warm, hospitable African country where the sky is always blue and the sun always shining brightly. Try our unbeatable prices and travel service when you search for the right holiday on the islands and coast of Mozambique – we can tailor make your special beach holiday at an appropriate resort at the click of a button. Massinga Beach Lodge near Inhambane offers you a very affordable Stay Pay Special Package where you get to stay for five nights but pay for four. Choose an ocean front deluxe room complete with plunge pool, bath with sea views and plenty of light and comfort. Enjoy all meals daily as part of this special deal. Why don’t you try snorkeling off the beach, horse riding up the beach or join the ocean cruise for a sundowner while watching whales breaching? Rio Azul near Vilanculous is also another favorite especially for anglers. Some guests prefer to leave the mainland behind for the romance of the islands and the closest and largest islands happen to be in the Bazaruto Archipelago, home to the rare Dugong and myriad dive sites that will take your breath away. Find a beach hotel on Benguerra or Bazaruto islands where nothing is too much for the friendly staff – spend your beach holiday in accommodation made for royalty. The Benguerra Lodge long stay package may suit you best – spend five or seven nights in this luxurious lodge right on the beach during your next summer holiday. The best part about the current Benguerra Lodge villas is their deep, copper bathtubs with sea views and the outside shower for a morning revive. Swing in your hammock to the sounds of birds in the forests around you. However, the lodge is currently being refurbished and will be opened in April 2015 with a completely new look, including the revamped casitas. There will be brand new guest areas and a world class activity centre. 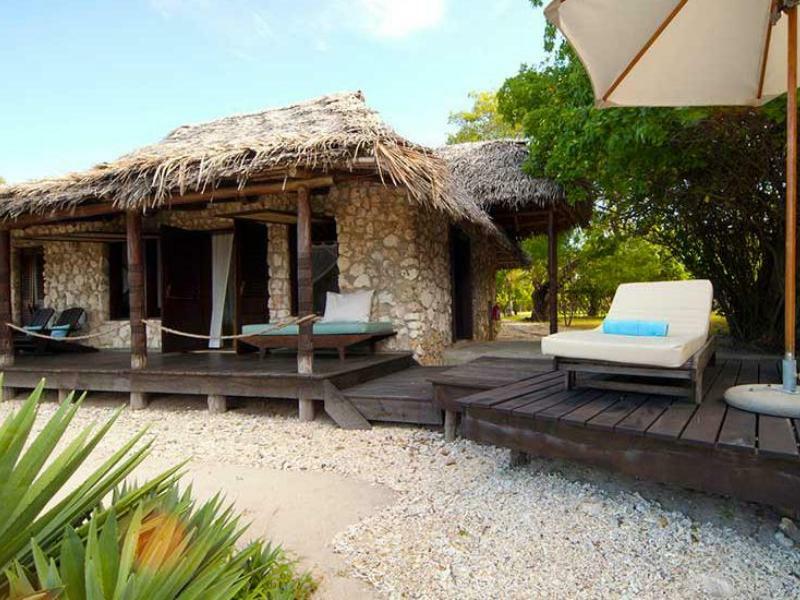 If you are keen to travel into the northern reaches of the Quirimbas Archipelago then Medjumbe Private Island is for you – picture rustic eco chic accommodation on the beach, promising you the holiday of a lifetime. The five day package deal includes your return flights and air transfers between Pemba and the resort, all three meals, your drinks, wonderful water sports including kayaking, windsurfing, hobie cat sailing, and Pedallo boats for a bit of fun! This is just the tip of the iceberg – make that sand dune! – so contact one of our experienced travel consultants to book your holiday package in a villa of your choice – right on the beach of course.